Under some circumstances, the category selector selects more categories than he should. 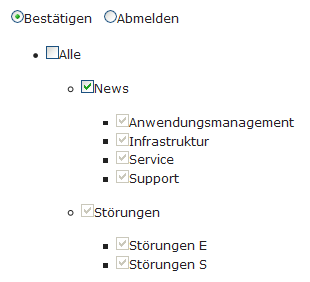 In this case for me clicking on the topmost checkbox "News" as well selects the whole subtree on "Störungen". I managed to debug this one and will share the solution with you - and hope, the author will incorporate it into the next version. It checks for the category Id and assumes, the category has ended, when the substring cat.0.1 changes.